Who has the right to the city? While giving priority to pedestrians may seem obvious, many cities have been built around reliance on the automobile and now struggle to reclaim streets for pedestrians or fail to see the value in doing so. Temporary and short-term redesigns are one low-risk way some cities are experimenting with taking back streets for pedestrians. 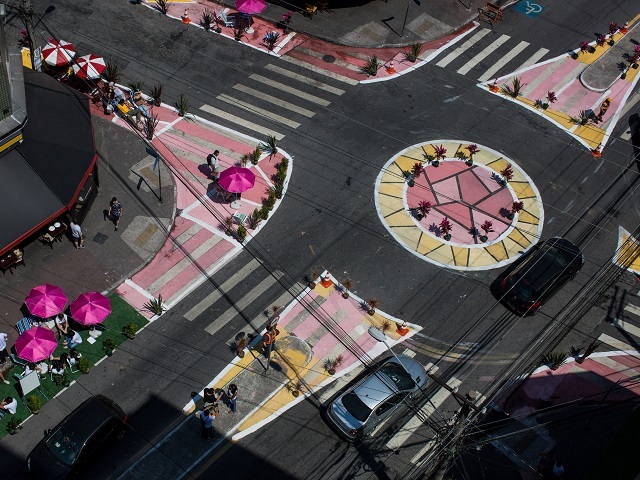 Following a growing trend, last month, Brazil converted two car-dominated areas of Fortaleza and São Paulo into pedestrian spaces, demonstrating the benefits of more human-centric urban development. 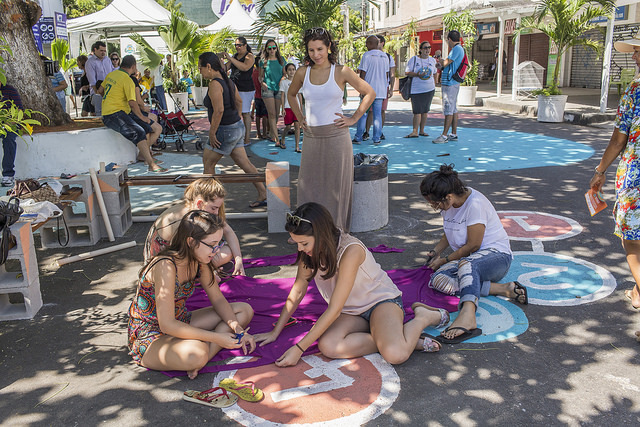 Cidade da Gente, or “City of the People,” is the first traffic-calming street transformation intervention in Fortaleza. In Cidade 2000, a residential neighborhood with local markets by day and a bustling restaurant district by night, the project reversed traditional road priority from vehicles to pedestrians. Cars were not completely excluded – one lane of traffic and parking spots were still available – but Cidade da Gente turned 1,200 square meters of parking space and traffic lanes into a pedestrian area for 15 days. The city wants to involve residents in shaping their public spaces and measure how people interact with the new space. The transformation used paint, potted plants, benches and cones to create a bigger and improved area for pedestrians, expanding previously narrow sidewalks and adding street crossings and curb extensions to improve safety. One traffic lane was removed and the speed limit was also reduced. During the first weekend, the city administration used the area for musical performances, professional workshops and health screenings. The goal of the initiative was to cultivate champions of human-oriented urban design and to show residents and cities what can be done to enhance public space. 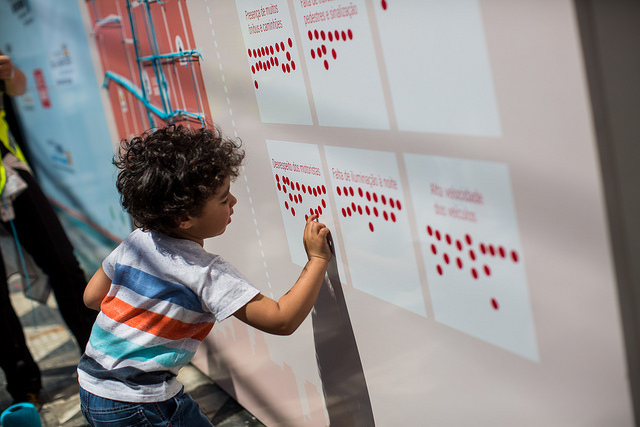 For two weeks, residents were able to provide feedback on the new urban design through an online platform developed by the city in partnership with the University of Fortaleza. Public opinion was overall positive, petitioning for the intervention to remain after the pilot period. Initially planned for 15 days, the city is now continuing the changes indefinitely. In São Paulo, another temporary intervention caused residents of the Santana neighborhood to reconsider the way they relate to urban design. 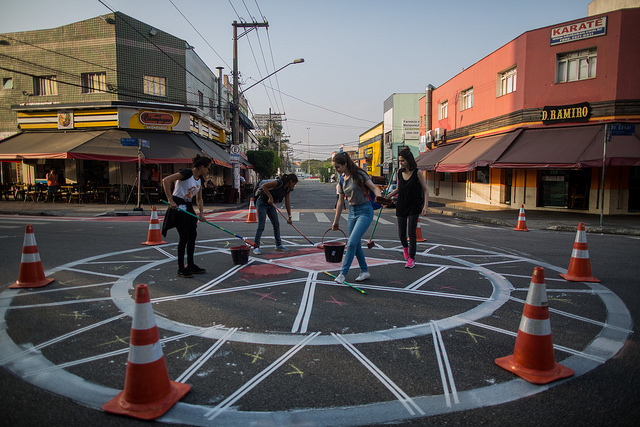 In response to a challenge posed by the 11th São Paulo Architecture Biennial, the Institute for Transportation and Development Policy and Citi Foundation conducted a temporary urban intervention in partnership with WRI Brasil, the Bloomberg Initiative for Global Road Safety, Global Designing Cities Initiative, and city-run Traffic Engineering Company, CET-SP. The intervention near Santana subway station and bus terminal, a very busy commercial area, included bright patterns and colors on street surfaces, with different types of traffic-calming measures, such as widening the pedestrian refuge medians, curb extensions and creating a mini roundabout. Two parking areas were turned into active areas, and obstacles like potted plants and traffic cones were positioned so people could not cross the street in dangerous places. Together, these changes organized traffic flows and reduced vehicle speeds, improving pedestrian safety. The goal of the São Paulo project was to show residents how road safety can be improved through impactful design solutions and demonstrate the enhanced experience of walking through more “complete” streets. “As the design of the street changes, so does the behavior of people – pedestrians, drivers, cyclists and all other users,” Lemos said. The WRI Brasil team took advantage of the transformation to interact with pedestrians and analyze their flow around Santana metro and bus station. The residents marked on a map how they traveled to and from the station and highlighted high-risk areas in the neighborhood. Both interventions show that building better, safer and healthier urban environments does not require large and costly new infrastructure. Spaces like these can be built with minor investments in any city and residents quickly recognize their benefits. Though both projects were well-received, the experience in Fortaleza in particular catalyzed a bigger change. The city expects to incorporate feedback from residents into the Cidade 2000 low-speed area project and implement similar interventions in other parts of the city. The original version of this article appeared in Portuguese on WRI Brasil. Bruno Felin is a Communications Specialist at WRI Brasil Sustainable Cities.